The very best nose job results are those that are natural and do not scream, “I just had rhinoplasty surgery.” No patient wants that, nor does their doctor. A talented, experienced surgeon knows how to achieve the perfect balanced rhinoplasty for your facial structure, so it is only noticeable because you look better. That is the part you want noticed, you looking better and feeling better about yourself. When a patient decides they want to have a nose job, it usually has taken them quite a long time of deliberation. They know what they dislike about their nose and face, and they know roughly how they desire to look afterward. Better might be the universal answer. Whatever “better” means to you, it should be a subtle, natural change. You may have a picture in your mind, or you may bring one from a magazine showing the look you desire, but it may not be right for you. How to achieve that subtle outcome depends on your surgeon. Dr. Oakley Smith and his professional staff will counsel you regarding your achievable results. If that picture in your mind or from a magazine is not possible, he will honestly tell you. Sometimes your dream nose is not proportional to your facial features, or it is just not physically possible to do. What he will do is show you what can be accomplished. A 3D image of your nose will be produced so you can clearly see the outcome. As an artist, sculptor and surgeon, Dr. Smith will do an illustration, or an artist rendition, of your proposed results. He understands that you want to see a pleasing appearance each time you look in the mirror. The best nose job results involve choosing a change that appropriately fits your face and your bone structure. The understanding and empathy that each patient is different. Each patient has their own concerns and vision of how they want to look after their rhinoplasty. Dr. Oakley Smith listens. Honesty: Dr. Smith will tell you if your desired results are possible and if they will give you the desired natural appearance. The expertise of an artist, sculptor and surgeon so that you can achieve your best look. Transforming you into the person you want to see in the mirror is Dr. Smith and his staff’s highest goal. 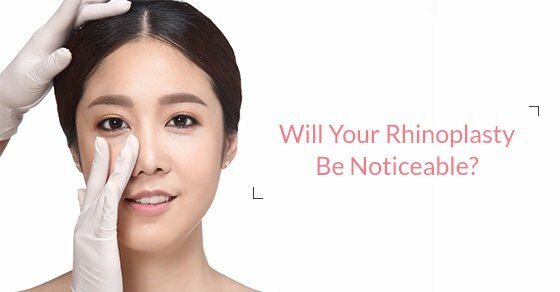 So will your rhinoplasty be noticeable? Only in a good way. People will think you look better, maybe younger or thinner, but they might not be able to decipher why. That’s the best nose job results! Schedule a consultation today and find out what is possible for you.